Lenny Dykstra and Darren Dalton at Spring Training in 1995. 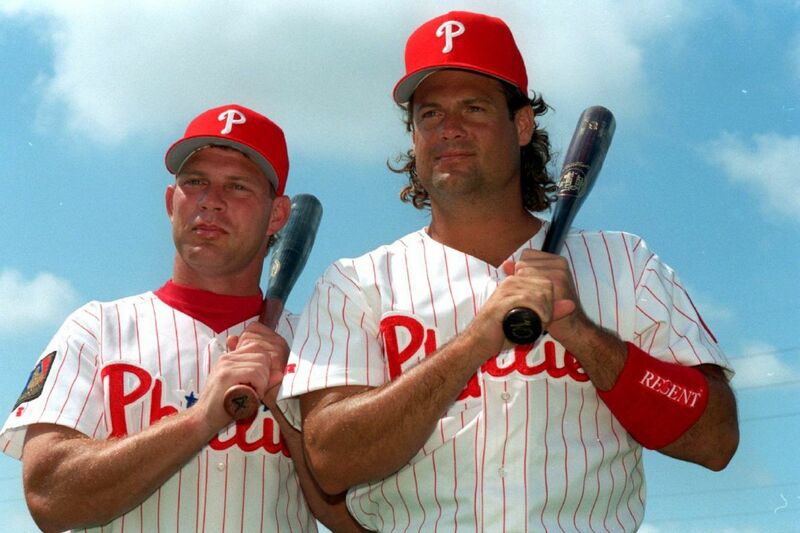 After the death of Phillies great Darren Daulton, who died Sunday after a four-year battle with brain cancer, former teammate Lenny Dykstra took to Facebook to deliver a moving message about the man he has come to refer to as a brother. "Dutch, as we called him, was a warrior and a leader," Dykstra said early Monday in a video, fighting back tears. "He was the kind of guy that you wanted on your team, and he was without a doubt the unquestionable leader on a team that went from last from first in 1993, where we made baseball fun again in Philadelphia." Before joining the Phillies, Dykstra said on Shark Time Radio last week, Daulton couldn't stand him, "a common feeling amongst many of those who were not my teammates during my career." But once Dykstra joined the team, the two became "brothers," as Dykstra put it. Daulton remained close to Dykstra, even as legal problems began to overtake Dykstra's life. After the three-time All-Star pleaded guilty to bankruptcy fraud and other federal charges in 2012, Dykstra revealed that Daulton had written the judge a letter on his behalf. Your honor, my name is Darren Daulton. I'm a former Major League Baseball player who played with and against Lenny Dykstra. I have become very good friends with him and his family. I believe I know what he is capable of doing when times are good, as well as when they are difficult. Obviously, there are two extremes that the Dude has lived through. We all experience the extremes, some more than others. Your honor, tonight I pray that God provides you the wisdom to judge my friend and provide him the opportunity to make amends with himself and the people that love him.